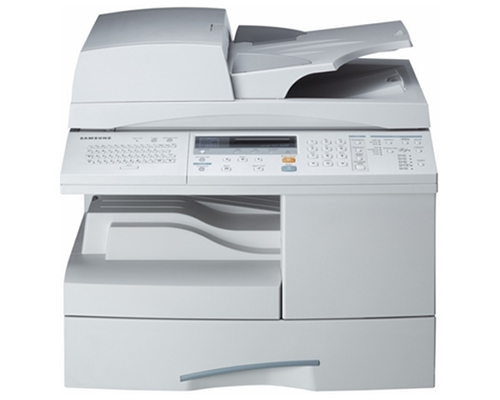 The Samsung SCX-6320F is a multifunction copier, printer, scanner, and fax machine designed for office use. It offers features comparable to many models like it and more options than other Samsung units. The unit measures 22" by 17" by 15.6" and weighs less than 70 lbs. Though it is an office-capacity machine, it is fairly small and lightweight, making it viable to place it alongside other computer equipment, on its own table, or on a credenza or in a printer cabinet. The unit has a more than satisfactory 550 sheet capacity and a 100 sheet bypass installed standard, as well as a 50 sheet automatic document feeder. An optional 550 sheet paper drawer can be added, bringing the unit's capacity up to 1300 sheets, over two reams of paper and well over what an office goes through in a day. It supports media sized between 5" by 7" and 8.5" by 14" and can print to media weighing between 16 lbs and 43 lbs. It can print to paper, envelopes, labels, card stock, and transparencies, and print to media sized Letter, A4, Legal, and Folio in its tray. Its manual tray supports all of these, but also Executive and Envelopes 6-3/4, 7-3/4, #9, #10, DL, C5, and B5. The copier produces documents at the industry-standard speed of 20 pages per minute and the standard resolution of 600 by 600 dpi. 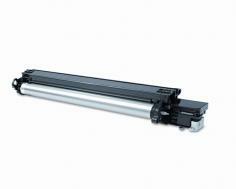 It produces up to 999 copies in a single job and performs enlargements and reductions between 25% and 400% on the platen and between 25% and 100% through its ADF. Automatic duplex copying is standard, and the printer supports scan once, copy many, book copy, margin shift, ID card copy, poster copy, auto-fit, and clone copy. The printer prints at 20 pages per minute and at a resolution of 1200 dpi, consistent with most models like it. Again, automatic duplex printing is standard. The scanner scans via TWAIN and in color using a color CCD at resolutions between 600 by 600 dpi and 4800 by 4800 dpi. It can scan a document at a maximum size of A4/letter and at 8-bit, 24-bit, and 36-bit depths. The fax machine operates using a 33.6kbps modem at a transmission speed of approximately 3 seconds per page. 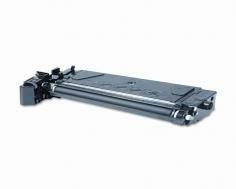 Platen fax moves at approximately 1.4 seconds and scans through the ADF move at approximately 1.5 seconds, and can transmit at a maximum resolution of 400 by 400 dpi. It has 16MB of memory and can both send and receive two-sided documents. It also auto-dials 40 locations and can speed dial 200 locations, but also supports broadcasting and polling. The unit includes 48MB of memory, expandable to 80MB. It has USB 2.0 and IEEE-1284 Parallel to ensure forward and backwards compatibility. The printer supports Windows operating systems beginning with Windows 95 and many flavors of Linux. A networking kit is available for the copier than adds a NIC and a memory expansion in order to connect the printer to a network. The unit has its own keyboard attached to its control panel, making it possible to directly send documents from the networked copier. A mechanical copy counter and a Foreign Device interface are both available as expansions. A downloadable font ROM can also be added, which provides 8 MB of fonts. The SCX-6320F does not officially support Mac OS X, requiring that you get a PostScript 3 expansion in order to enable Macs to use the printer. Like many other printers, a USB cable is not included, requiring that you purchase one if intending to connect the printer via USB. While this isn't necessarily a con, it is an inconvenience worth noting. Review it: "Samsung SCX-6320F "
The SC-6320F consumes 2-piece Toner/Drum cartridges. The unit's toner is measured as producing approximately 8000 sheets at 5% coverage before needing replacement, and at approximately every 2 1/2 cartridges the drum unit will require replacement, as it is rated to produce approximately 20000 pages at 5% coverage. Because the two functions are split, this will bring down long-term costs, though it will require additional maintenance to ensure optimal function.